The Cuisinart Sorbet maker turns what was once a labor intensive task into something fast and easy. In as little as twenty minutes you can begin enjoying everything from frozen yogurt to a frosty beverage. Better still, unlike many ice cream makers, this little machine requires no messy salt or water. The price on this little gadget is right in line with other dessert-making accessories for the kitchen. Coming in at $50 the price makes it very appealing, especially if you enjoy knowing whats in your ice cream! The top of the Cuisinart Sorbet maker is clear so you can watch your ingredients as they go in, and peek to see your dessert in the making. This top also allows you to add other delicious components to your sorbet toward the end of the process  like dried diced fruit, bits of marshmallow, and of course chocolate chips. The kids (of all ages) are going to love coming up with interesting combination's to try! From a maintenance perspective the freezing chamber is non-stick, making for easy clean ups. When the machine isnt in use, you can leave this chamber in the freezer  that way its ready whenever you get a hankering for ice cream. As with many Cuisinart products, youre given a 3 year warranty and a decent instruction book that includes recipes to get you started on your ice cream adventures right away. I really see only two design flaws in this ice cream maker, and both are fairly subjective. First, weighing in at 9 pounds with a 10 diameter this isnt a tiny machine that will pack tidily away when not in use. For a small kitchen with limited counter space it could easily become the proverbial black sheep as a result and end up in the next garage sale. Another complaint I have is the noise this machine produces. I love ice cream, but find myself not using it as much as I might simply because the loudness is bothersome. I need to be several rooms away to enjoy music, and I would rather enjoy watching the ice cream being formed. Most people who wrote reviews about the Cuisinart Sorbet maker seemed very happy with their purchase. They report that the resulting ice cream is as good (if not better) than premium brands. Other features that made buyers happy included a strong motor, the ease of cleaning, the simplicity of the parts, and the swiftness of the overall process. The only complaints that came up were about the noise the machine makes, and one individual who had a faulty freezing bowl and didnt receive good customer service from the company. Considering personal experience and other consumer reviews, this is a great gadget to add to your wish list for the kitchen. If you have children, youre going to be the house where everyone hangs out just to see your next creation made with the Cuisinart Automatic Frozen Yogurt-Ice Cream & Sorbet maker. 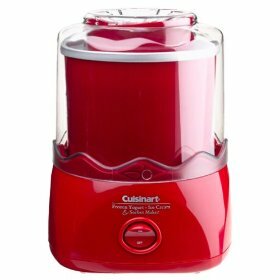 Amazon offers the Cuisinart 1-1/2-Quart Automatic Sorbet / Ice Cream Maker in either Red or White.